The BUAA Library has been open for use since 1952. The total area of the Library is currently 1,8000 square meters. The main body is a six-story building, in bright white color. One annex is besides the main building. The Library is basically open 80.2 hours a week. The University Library houses the collections of books, the subscribed journals and other special documents (such as technical reports). It now has approximately 1,200,000 volumes of books, 1,235 periodical titles and hundreds of newspapers, and more than 60,000 items of non-paper materials, including CD-ROM's, micro-films, microfiches, videotapes, audio tapes, audio CD's, Laser Disks, CD-titles, etc. In addition to the paper-dominated resources, we also provide about 80 online databases, such as Ei Village, OCLC FirstSearch, CSA, Aerospace, PQDD, IEEE, Elsevier, etc. All of them are mounted on the campus network, so that the users are capable of using them in their offices, dormitories, laboratories, and faculty housings, etc., 24 hours a day. We also actively participate in inter-library cooperation on a worldwide scale, so that information resource sharing can be realized. 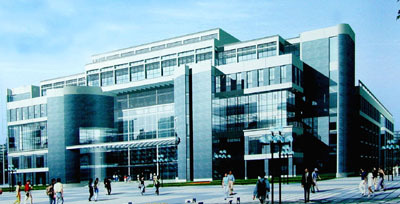 We have Inter-Library Loan with National Library of China, Beijing Documents Service, The Library of Chinese Academy of Sciences, National Science and Technology Library, and Tsinghua University Library, etc, in such an extent that all the faculty members and students in BUAA Library can obtain documents from the above libraries. An integrated automation information system and other electronic facilities aid the Library�¯s services. Most of our information systems are connected to the campus network, CERNET, and Internet as well. The Library has also built a World Wide Web server to facilitate the users in the campus and around the world. In the Library, we have more than 2000 reading seats, including carrels, spreading throughout the building, and 13 reading-rooms, 2 study rooms, and one classroom. The Library is operated in open-shelf system. Library services include Borrowing, Library Card Application, Copying, Library Instruction and Training, Information Courses, Document Supply Service (Inter-Library Loan), Recommending Materials, Information and Reference Services.